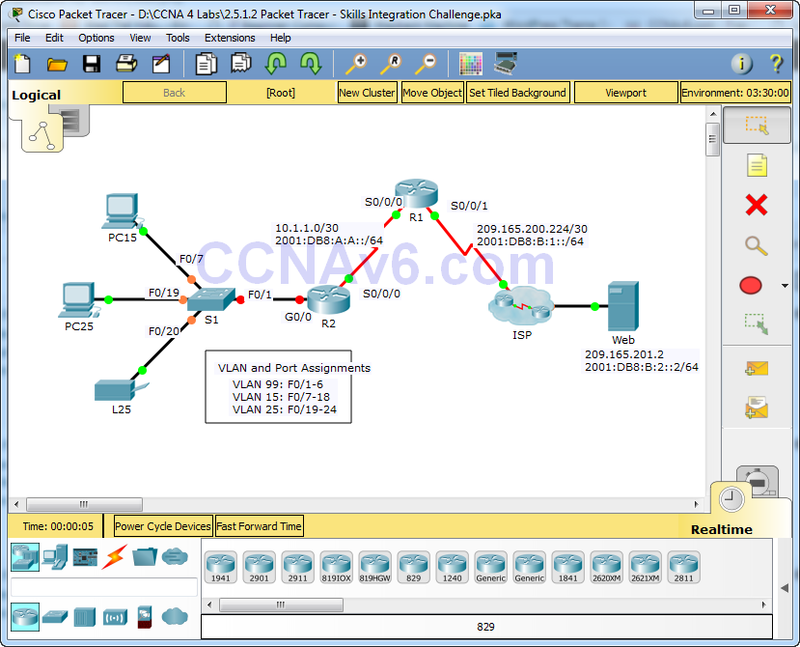 This activity allows you to practice a variety of skills including configuring VLANs, PPP with CHAP, static and default routing, using IPv4 and IPv6. Due to the sheer number of graded elements, you can click Check Results and Assessment Items to see if you correctly entered a graded command. Use the cisco and class passwords to access privileged EXEC modes of the CLI for routers and switches. The addressing scheme uses the 192.168.1.0/24 address space. Additional address space is available between VLAN 15 and VLAN 1. VLAN 25 needs enough addresses for 50 hosts. Determine the subnet and complete the subnet table below. Configure IPv4 addressing on the necessary end devices. On R2, create and apply IPv4 and IPv6 addressing to the G0/0.25 subinterface. On S1, create VLAN 86 and name it BlackHole. F0/1 is the native trunk for VLAN 99. 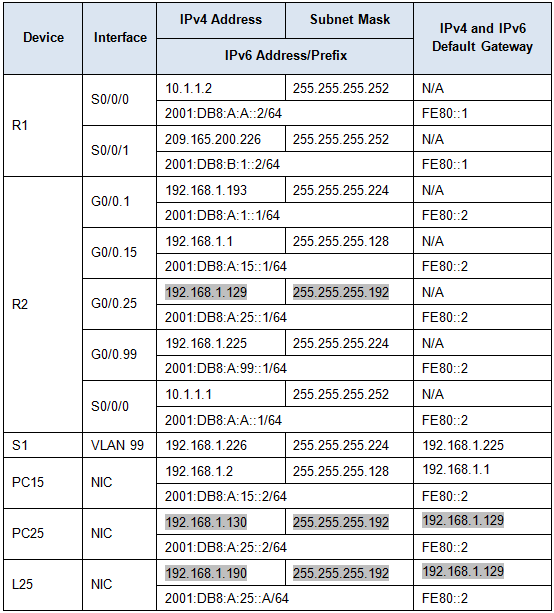 F0/7 – F0/18 as access ports in VLAN 15. F0/19 – F0/24 as access ports in VLAN 25. G0/1 – 2 and F0/2 – F0/6 are unused. They should be properly secured and assigned to the BlackHole VLAN. On R2, configure inter-VLAN routing. VLAN 99 is the native VLAN. Configure R1 and R2 to use PPP with CHAP for the shared link. The password for CHAP is cisco. On R1, configure IPv4 and IPv6 default routes using the appropriate exit interface. On R2, configure an IPv6 default route using the appropriate exit interface. Routers R1 and R2 are in area 0. R1 uses router ID 1.1.1.1. R2 uses router ID 2.2.2.2. On R1, propagate the IPv4 default route created. Configure OSPF on appropriate interfaces on R1 and R2. All devices should be able to ping the web server. Really good practice LAB. Nice work! !